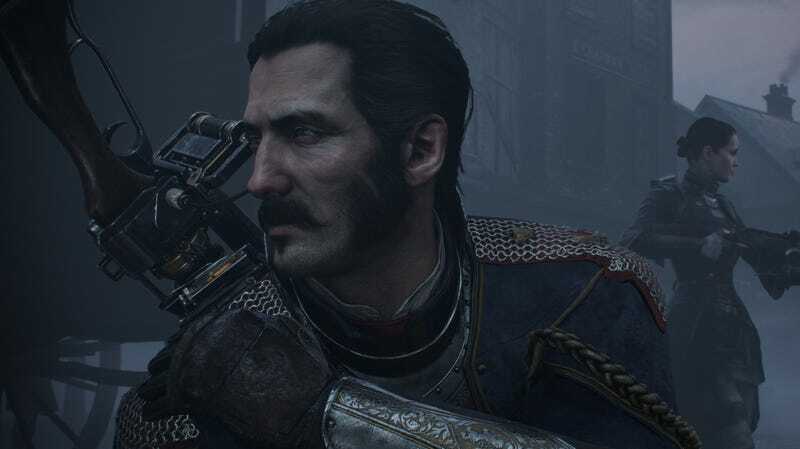 You know, I didn't think about framerate or resolution once when I got to play The Order 1886 yesterday. What I did think was that it felt like playing through an old Cinemascope movie. With at least one very cool signature weapon. I played through the Inequalities chapter that's been previously shown, huddling behind cover and blasting away at human enemies across the streets of an alternate-reality London. Shooters live and die by the ingenuity of their weapon design and The Order's thermite rifle was the first thing to make me think that there might be some spark to the thought going into the game. It's a dual-action firearm that fires a long-range burst of combustible thermite particles that can be set aflame by a flare. So, as two or three enemies scrambled on a roof across the street, I could fire the thermite cloud first and then shoot the flare to instantly explode the air around them. Follow-up clouds keep the fire going, too. Players can also fire the complementary payloads in a different order, going flare first and thermite next for a delayed reaction. I also used a pistol during a sequence where I had to drag a fallen friendly to safety but didn't note anything remarkable about the gun during my brief time with it. Later on in the demo, I used the game's Blacksight power to slow down time and down enemies with deadly precision. A corollary of drinking a mysterious fluid called Blackwater, the ability was reminiscent of the Deadeye mechanic in Red Dead Redemption. Much has been made of the framerate for Ready At Dawn's upcoming PS4 exclusive, which is 30 frames per second. The game's also going to live inside a 1920x900 window on-screen, instead of the more common 1920x1080 resoluton, to better approximate a cinematic experience. Those choices about how to present the game have been made in the service of creating a specific effect and I can say that The Order does generate a very specific Victorian-era, everyone-has-blacklung mood. The world looks bleak and dank but is also sharply detailed and impressively lit. The steampunk detailing on the gear doesn't jump out as overly egregious–it's not gears everywhere from what I can remember—but does underscore the idea that technological development took a very different path in the game's fictional universe. The demo I played was short, ending with a cliffhanger encounter with a masked enemy using the same thermite weaponry that the game's protagonists use. Despite the quickness of my first taste of The Order, my level of curiosity about the game definitely increased. It feels like the 2015 game has a clear vision that it's trying to execute. We'll see how well it does that when it hits PS4 next February.